When the news broke that the mayor of 30 years was retiring, Irvine decided that “sometimes you just have to run for mayor. “I ran to voice my neighbors’ issue about the local university, and also make a documentary about it to show other young people how to run for office,” he said. Irvine’s production company, Overbites Pictures, signed a deal with a company called Indie Media Entertainment, which distributed the film on Amazon for four years but never shared any of the profits with Overbites. 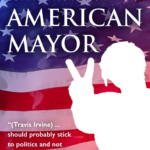 Now that technology has improved, Irvine said Overbites hired a lawyer to deal with IME, took back control over the film, and is now launching “American Mayor” on Amazon as a streaming movie for the 10th anniversary of the race. The movie will be re-released on Tuesday, Sept. 19.